Cant wait my present to myself …!!! I’m excited to see this game and I would love to demo it!? Awesome! But what about a special edition or a PS4 Pro bundle? Yes!!! Not that I needed any incentive to pre-order! I cannot wait for this game! Will these suits be unlockable throughout the game whether we pre-order or not? Or are they exclusively for those who pre-order? I think I read somewhere that the pre-order bonuses are not available after the game releases. Yes they will be unlockable in-game so no preorder needed. He said “early access” so yeah basically a confirmation that they’ll be unlockable in the game without pre-order.Or maybe via DLC lol. Why have you guys done the MCU version? 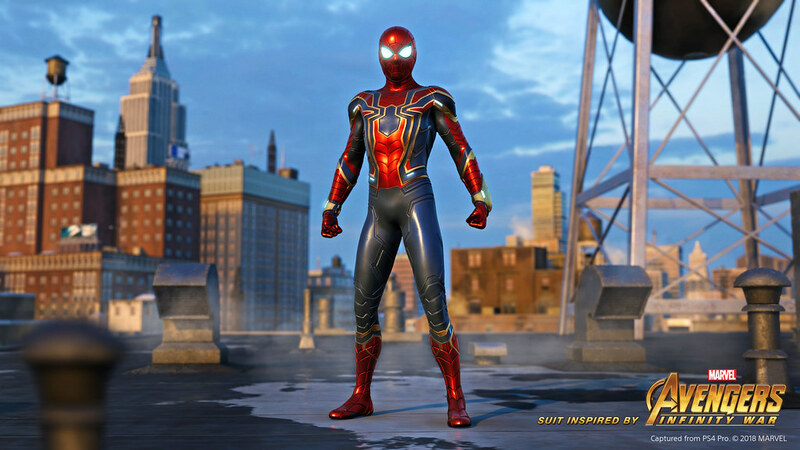 The Comic Book, original Iron Spider costume will be unlockable in the game right? I want to see comic book suits which wouldn’t or couldn’t get done in the films. Good luck wishing they won’t promote the movies. HECK YES! I am so stoked to see this as an option in-game! I’m guessing that the homemade suit in the trailer is basically confirmed now, which makes me REALLY HAPPY :D Will we see the Raimi suits as well as the Amazing Spider-Man suits? I’m guessing the answer is yes! This is the only game that I’ve purchase the Collector’s Edition for, which means I AM REALLY EXCITED ABOUT IT! Keep up the hard work Insomniac! I just want Black Suit Spidey and I’ll be happy. If Noir will do to you then you can be happy as it’s already confirmed but they said they ain’t touching the Symbiote subject in the game so if you want Symbiote Spidey well…like me you can be sad lol. PlayStation is destroying Xbox. Spiderman looks amazing. please 2099 vs scarlet spider. It’d be great if they included the wrestling suit from Spider-Man (2002)! I’m there with you mate…they need to add that one. Can we have actual gameplay and no scripted trailers please? Game looks cool, but if your meat is a repetitive typical open world mission grind, no thank you.﻿ I’ve yet to see an actual person playing it. Saw the leaked video last week but I must say I never thought this was actually an iron suit.Saw it at the end of Homecoming and also at the Infinity War trailers but never looked like and iron suit to me,damn even being a Spidey fan I never knew such suit existed in the comics,lookin at the thumbnail now and seeing how it looks like an armor daamn that suit is cool as hell.All I care about is the original suit but it won’t hurt to have many choices to choose from.Great job y’all and of course day 1 buy here. PS:If y’all can’t wait for us to see more of the others suits y’all just need to reveal them,pretty simple lol. I’ve been a fan of Spider-Man for years he looks amazing and his new abilities this is the Spider-Man game I’ve been waiting for a while!